The Creeper is the quintessential Minecraft mob. An ambush predator. Though not necessarily bent on the destruction of your creations, they regularly damage them as a side effect of focusing on damaging you. Much like a bee, their 'attack' results with their own demise. The 'attack' is a suicidal explosion, that damages a small radius around the Creeper. Any blocks within this radius are annihilated and whatever player created work is also destroyed. Point is, this mob is a jerk who wants you dead... stay clear of him. He doesn't want to hug you, he isn't cute, and he's a sociopath who wants you to fail. When you hear it's signature hiss... It may be too late. It does not sleep, it will find a way. It is the Creeper. Drawing on paper. Check out my Ghast Fan Art and Enderman Fan Art too. 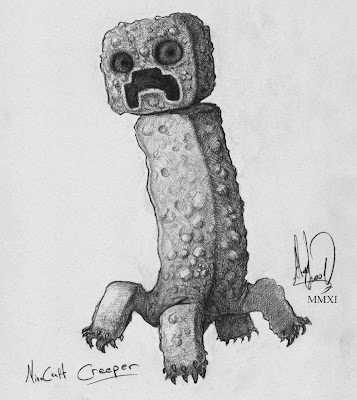 I'm writing a story and need a sketch of a creeper sketch in it. Can I, by chance, use yours? I will give you a URL credit of your choice, if you wish.